The ways we praise our children affect how they see their own strengths and weaknesses. Get on the growth mindset train with this free printable. What if the Little Train had more genius to it than we ever imagined? What if the true belief that you CAN moves you closer--significantly closer--to that possibility? "In a fixed mindset students believe their basic abilities, their intelligence, their talents, are just fixed traits. They have a certain amount and that's that, and then their goal becomes to look smart all the time and never look dumb. In a growth mindset students understand that their talents and abilities can be developed through effort, good teaching and persistence. They don't necessarily think everyone's the same or anyone can be Einstein, but they believe everyone can get smarter if they work at it." Strategies for parents: easy ways to help your children embrace challenge! Free printable reminders. In my family, I'm the youngest of three, the baby to two brilliant siblings. Growing up, I often compared myself to my sister (with the photographic memory) and my brother (with the immense capacity for knowledge). I believed that I was born with less than they were. Somewhere the thought occurred, "did my parents run out of all the good genes by the time I was born?" Through a variety of influences, including unassuming teachers and mentors who told me I was smart and talented, I came to the childhood/adolescent conclusion that I was this smart, with these talents, and could therefore do these things. And then my world--neat, pre-determined, and a little sad--was knocked off its orbit by the asteroid of art. In the great quest for pubescent self-discovery, I decided that my niche would be art. This talent was also already taken by my siblings, but, nevertheless, I was determined that I could be a better artist than I had been. Somehow the subjective bandwidth in art broke down my fixed mindset, little by little, making way for new discoveries into how I could and I was progressing and always building upon my own talents. Quite naturally (and beautifully) this idea that I could get better, learn from my mistakes and build upon them, and grow with hard work permeated into other areas of my life. I had once viewed myself a poor, slow reader, and I was now reading and comprehending stacks of books, and enjoying them. Moreover, I began to understand that despite whatever perceived struggles or limitations I might have in any area, with effort and determination (a key here), I could and did improve. You might be thinking, "hello, obvious, how are you?" But let's take this idea a step further into parenting. When was the last time you told your child (in an effort to be a supportive, loving parent), how smart she/he is? Or mentioned how talented she/he is? Do you have a growth mindset for yourself? Take the simple quiz here. Subtle adjustments to our parenting talk (and our internal dialogues) can make enormous changes in the ways our children perceive, achieve, and embrace challenge. Gah! Changing the comment from "You are such a smart girl!" to "You worked so hard and look what you achieved!" can alter how our children perceive their own abilities. Encompassing a growth mindset instead of a fixed one, helping them to strive for progress and growth instead of an unachievable (and therefore ultimately disappointing) finite goal can all be a part of our parenting conversations and the family environment that we cultivate. 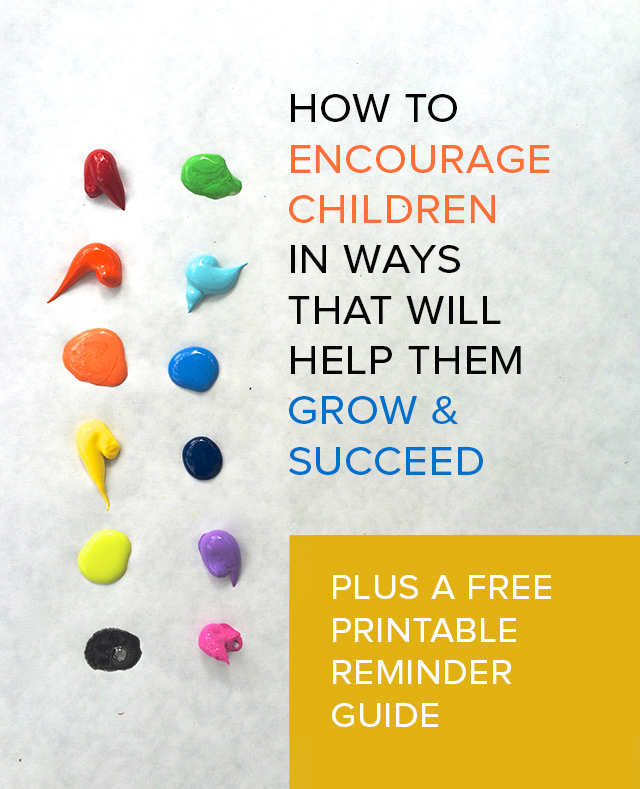 Get the free printable guideline on how to talk with your children in ways that will help them grow and embrace challenge. Most stunning to me is how easy this is to implement. Consider the brain as a muscle that gets stronger with use, and the more challenge we give it, the more opportunity we have to grow. Consider next time when your child comes running to show you the great grade on a math test, how will you respond? "You worked so hard, and it paid off. It's great to see your determination." Are you ready to help your child move to a growth mindset? Or ready to adopt one for yourself? I've made this easy guide to keep handy to get you on track quickly and easily. Click the yellow box below to get it and more Pars Caeli goodies! Sign up and get our free and totally helpful, one-page simple guide!